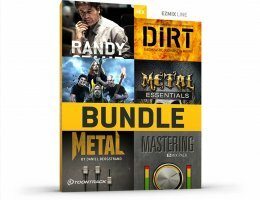 This convenient bundle comes loaded with six (6) handpicked EZmix Packs optimized for the ABCs of metal mixing and mastering! It will take you all the way from custom guitar amp/cab simulation settings by four of the most iconic and trendsetting guitarists in today's metal scene to packs designed by top producers like Randy Staub (Metallica's "Black Album") as well as genre based packs like Metal by Daniel Bergstrand, Metal Essentials by Jason Suecof and can't-be-without's like Mastering! This bundle got you covered from the first riff idea to the finished, mastered mix, ready to take over the airwaves! Custom designed amp and cab simulation presets from four of the most iconic and trendsetting guitarists in metal: Fredrik Thordendal (Meshuggah), Mattias IA Eklundh (Freak Kitchen), Misha "Bulb" Mansoor (Periphery) and Devin Townsend (ex-Strapping Young Lad, The Devin Townsend Project). Randy Staub had mixed groundbreaking works like Metallica's "Black Album", Mötley Crüe's "Dr Feelgood" and honed the sound for artists like Nickelback, Bon Jovi and Alice in Chains. Randy is beyond just an award-winning mix engineer, he's helped define the sound of a generation! This pack does exactly what it sets out to: cover the essentials in metal mixing! The fact that it was hand-crafted by the creative mind behind the sound of August Burns Red, Trivium, All That Remains and The Black Dahlia Murder says a little bit about how heavy it sounds! Having worked with acts like Meshuggah, In Flames and Behemoth, engineer/producer Daniel Bergstrand has reinvented the sound of metal! Designed by the man who helped define the shape of punk to come: Pelle Henrcisson. With 30+ years honing his craft behind the mixing console and world-renowned for his work with legendary heavy-weights like Refused ("The Shape of Punk to Come"), Meshuggah ("None"), Poison the Well and Hell Is For Heroes, Pelle knows a thing or two about mixing! Between them, they have several Grammy Awards and engineered, mixed or produced groundbreaking works like Metallica's "Black Album" (Randy Staub), Chris Isaak's "Wicked Game" (Mark Needham), Dire Strait's "Brothers in Arms" (Neil Dorfsman) and Steve Earl's "Guitar Town" (Chuck Ainlay). Combine that with mastering settings by a senior engineer at the leading mastering studio in Scandinavia as well as a great addition to the core EZmix 2 content and you have a lethal combination for making your music sound great!